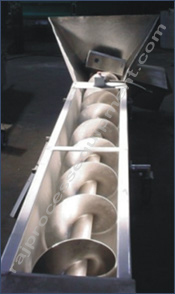 Material handling equipment screw conveyors India. Screw conveyors in modern industry are often used horizontally or at a slight inclination as an efficient way to move semi-solid materials. These can have a greater pitch spacing, resulting in a higher capacity without an increase in rotation speed. They usually consist of a trough containing either a spiral coiled around a shaft, driven at one end and held at the other, or a Shaftless Spiral, driven at one end and free at the other. Fuels: chippings, straw, sawdust, wood dust, peat, pellets, carbon, etc. Waste matter: sludge, slaughter waste, manure, garbage, ash, bark, machine grindings, etc. Food products: grain, powder, sugar, salt, flour, rest products, etc. Various chemicals, minerals, dyes, pigments, starch, detergents etc.